Remember How in shape you use to be? 1. Don’t Get Out Of Shape! While it may seem obvious, the easiest way to “get back in shape” is to never fall too far out of shape to begin with. With modern stress levels being very high nearly all the time, it is very easy to skip the gym. But think of it like this: you have one dollar (this represents your total health), and every time you skip a planned workout it’s a withdrawal from that dollar. Sure, maybe it’s only a penny, but over time many missed workouts can add up to you having nothing left (i.e. being out of shape). As a personal trainer, I’ve never see a more common mistake than the person who is dying to get back in the gym and then promptly injures themselves. They simply go too hard too fast. This is where one’s ego comes in to play. You must accept the fact that you likely didn’t get out of shape overnight, and you likely won’t get back into shape, overnight. This may seem simple, but when put into practice, this can drive many people crazy. ​This goes hand-in-hand with our previous point. Of course you need to know that you are not in the shape that you previously were in and it will be ideal to get consult the help of a Personal trainer to make sure that your goals and your routine are properly planned out. This is perhaps the most important part. And by and large, why many people come to me as a personal trainer. Just the sheer knowledge that there is a plan, that you are not floating out there on your own in space, is a huge help. With a personal trainer you are more likely to keep appointments, more likely to stick to goals, and less likely to end up on the couch. This may be the hardest step, I won’t lie. Life has many, many, ups and downs. With our countries’ financial climate being uncertain, technology morphing at a rapid pace, and disease rates skyrocketing, it is quite easy to get sucked into a negative place and to stay there. But we must overcome this if we want individual success and long-term success. I suppose that you love your workouts right now and are satisfied with your results right? LOL ah probably not. 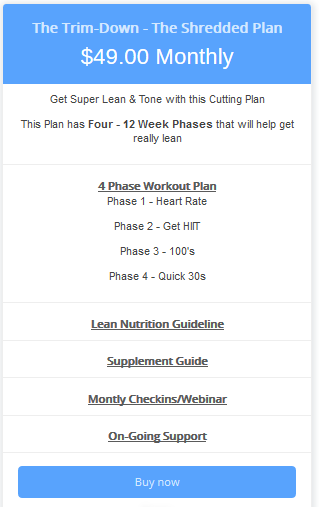 I have put together some ways to optimize your workouts and optimize your nutrition. We strive to be a resource for those that are excited and motivated about improving their fitness. the intensity of your workout are decreased rest times, circuits, forced reps etc. When you’ve been using the same routine for a while it’s easy to get stuck in a rut, you think you’re training hard but your intensity level has been dropping slowly without you knowing it. Switch up your exercises. Each muscle group has a variety of different exercises that can be used to train it. A lot of weight trainers get stuck into the same exercises week in week out. They cut out exercises they “don’t like”. To continue to grow you need to hit your target muscles with a wide array of exercises. You should be switching regularly. Many experienced bodybuilders never do the same workout twice. 3-6 sets in total. One of the most popular types of drop sets is “down the rack” dumbbell bicep curls where you start off at a normal curl weight and move down the rack, going to failure on each set. Switch the days you work each muscle. Changing the order of your workout days can have a big impact on results. In general, you should work your weakest muscle groups at the beginning of the week when you have the most energy. But like everything else in your routine, you’ll benefit from change. One point to remember though when switching, always make sure you give each muscle group enough rest – keeping in mind that the muscle group may be hit as a secondary. For example, you shouldn’t do biceps Monday then back Tuesday – you need your biceps as a secondary muscle in all your back (pulling) exercises. You can also cycle your workout days so that on the first day of your workout week you focus on a different muscle group. Weekly rep cycling. Weekly rep cycling works like this. Week 1 – hit out 12 reps per set, week 2 – hit out 10 reps per set, week 3 – hit out 8 reps per set, week 4 – hit out 6 reps per set, week 5 repeat. No one knows exactly how many reps you should be doing for optimum muscle growth. What we do know is, it’s between 6 and 12. So cover all bases by starting at 12 reps and over 4 weeks decrease to 6, increasing the weight as you go. If you’ve got your diet right (which you should have if you want any of the techniques in this article to work) you should find that by week 5 you can lift considerably more than you could in week 1 for 12 reps.
Change the number of days you train. In muscle building, less is more. If you want to get bigger you don’t workout more. This is one of the most common mistakes of new lifters. 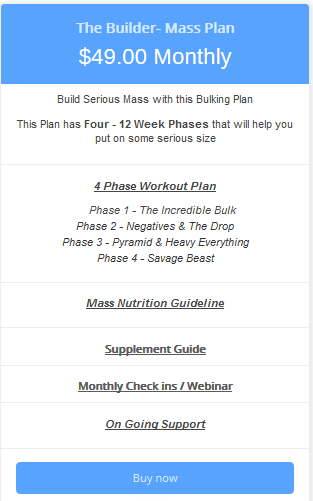 You think that dropping back to 3 days from 4 or 5 will mean you build less muscle? You’re wrong. Your body will probably benefit from the extra rest. Negatives. Negatives are extremely helpful in building strength, working up to exercises/weight and beating plateaus. Negatives are where you focus on the negative part of a movement by using very heavy weights (more than your 1 rep max) and a very slow movement. Spotters are needed for almost all types if negatives, so if you train alone, don’t bother with these – you’ll do yourself an injury. Good examples of negatives are bench press, barbell preacher curl, close grip bench, pull ups (jumping up and slowly lowering) and leg extension.Tip: Can't do pullups? Just do as many as you can then finish the set with negatives. You'll build strength fast. Use a very wide grip to emphasize you lats and not your biceps. Slow (controlled) reps. Slow reps are all about control and contraction. Using a lighter weight, with a slower movement, for the same number of reps. You should be using a 3-1-3 count. Meaning count “1 one thousand” 3 times on the way down, pause for “1 one thousand” and count “1 one thousand” on the way up. Using slow reps you do the same number of reps as you usually do but your muscles are under strain for a much longer time. Alternating & keep under strain (AKA partial reps). Like slow reps, alternate reps work the muscle group harder by keeping it under strain for a longer period of time. What you do is, take an exercise and modify it by not completing a full rep. For example, alternating dumbbell curls. Instead of letting your left arm hang while your right arm curls you do not complete the full rep, keeping your left arm slightly bent and under strain. This does not let the blood escape from the muscle (keeps "the pump") and makes it work extremely hard to hold the weight. After the set, your muscle has been under strain for twice the time as regular alternating curls. You can use this technique with loads of exercises like dumbbell shoulder press, dumbbell bench, dumbbell tricep extensions and kickbacks. Change the order of your exercises. If someone asked me how they should order their exercises I would tell them big compounds first, followed by isolations. But like everything else in your routine, your body quickly adapts. Switch up your exercises…do dips first on your chest day, extensions before squats etc. Forced reps. Forced reps are simple, do as many strict reps as you can without any assistance, then use a spotter to help you force another 2 or more reps out. You can use forced reps to get an extra 2 reps out (for example you hit out 12 on your regular 10 set) or you can up the weight by about 15% and use your spotter to help you force out your regular 10 reps.
Pyramid sets. As the name suggests, pyramid sets start from a low weight and work up to a heavy weight and/or then back down. After completing a proper warm up, the first set in your pyramid will be with a weight that you can push out 12 reps with good form. Your next set will be 8-10 reps, then 6-8, then 4. Then you can always work your way back to 12 reps. Technique is important here, no cheating. You want to do slow and controlled reps on ALL sets. Take the week off. Rest is the most abused aspect of weight training. Bodybuilding is not like marathon running, less is more. Sometimes you’ll find that taking a week off from training is the best thing for you. Our bodies (and minds) need regular rest breaks from intense resistance training. Our training routines put stress on the entire body, not just the muscles. How do you know when to take a break? You’ll know it, your body will tell you. But as a rough guide, every 8-12 weeks. Incorporating these fat loss tips will improve your nutrition program. Start off slowly and add one a week, you don't have to adopt all of them at once. Before long, you've cleaned up your nutrition program and on your way to reaching your goal. Trendy diets, fads and the infomercial product of the month, are not going to help you reach your weight loss goals. A well thought-out nutrition and exercise program will. Proven time and again, those who eat breakfast are more successful at controlling their weight than those that don't. Plus, when doing strength training exercises (and you know you should be), it's even more important to make certain you fuel those muscles after an overnight fast. The perfect time for burning fat because glycogen, blood glucose and insulin levels are all low. Unfortunately, it may also be perfect for burning muscle, because glycogen levels are low, and levels of the catabolic stress hormone cortisol are high. If you skip breakfast and eat lunch at noon, you're not only in a highly catabolic (muscle wasting) state, you're also sending an unmistakable starvation signal to your body. Simple sugars are digested very quickly and cause a rapid spike in blood sugar. Your body then releases large amounts of insulin. Insulin quickly clears the glucose from the bloodstream leading to low blood sugar (hypoglycemia.) Low blood sugar causes cravings, hunger, weakness, mood swings and decreased energy. These cravings for sugar result in a vicious cycle of ups and downs in blood sugar levels throughout the day. Studies have shown that those who eat 4-6 smaller meals per day have less body fat than those eating 2-3 meals a day, even if both groups eat about the same number of calories. This is because of maintaining steady blood sugar levels. Too much insulin activates fat storage enzymes and forces fat in the bloodstream into fat cells for storage. High insulin levels also inhibit enzymes that promote the breakdown of existing stored body fat. You can manage your blood sugar and insulin levels by choosing fewer simple carbohydrates, more complex carbohydrates, eating fiber and having your carbohydrates with lean proteins approximately every three hours. Protein speeds up your metabolism because your body has to work harder to digest, process, and utilize it compared to fats or carbs. Best for several reasons?It's cheaper than eating out, you know exactly what you are eating, and it saves time. It takes no more time to cook up 6 healthy chicken breasts than it does to cook one or two. Make things easy. Prepare them over the weekend and your lunches for the next few days are done. While you are at it, put on a pot of brown or wild rice, or bake up some sweet potatoes and you're good to go. LOTS! Most people are already dehydrated. Strive to drink a gallon a day. If you drink a lot of coffee, then you need an extra 8 oz for each cup of coffee. Exercise will put more demands on your fluid levels. You need water. Drink 5075% of your body weight in ounces of water. Add an additional 16 oz for strenuous exercise. No complaining! Here are some extra nutrition and exercise help that should be beneficial in getting you the level of health and fitness you deserve. I would recommend devoting at least 3 days per week for these exercises and 3 days per week of 30 mins of HIIT cardio. Here is a link for more details to Amp Up Your Workouts. Full-body compound exercises offer an efficient way to work out, by working several muscle groups at once and taxing your cardiovascular system. This is a great asset for busy people who barely have time to make it to the gym as it is. With just a few full-body compound exercises you can be in and out of the gym in a matter of minutes but have a body that looks like you spend hours working out. Perform two to 4 sets of 10 to 15 repetitions of each exercise. The thruster is a full-body compound exercise that combines a front squat with an overhead press. This exercise will target your hips, glutes, thighs, back, core, arms and shoulders. 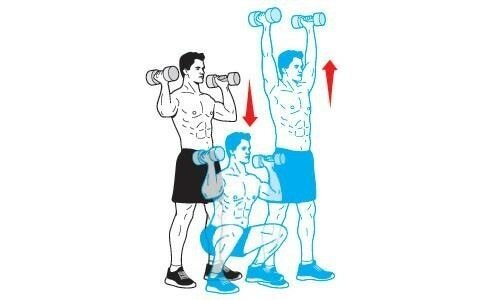 Begin by holding a dumbbell in each hand at shoulder level with your elbows bent. Adjust your feet to at least hip-width apart. Contract your abdomen, straighten your back then bend your hips and knees to lower into a squat. Continue down until your thighs reach horizontal. Exhale as you push through your heels to return to the standing position. As you near standing, use the momentum from your hips and legs to propel the weights upward. Press the weights overhead by extending your arms. That's one repetition. Lower the weights back to your shoulders to prepare for the next thruster. The deadlift is a fundamental human movement and one of the most useful full-body compound exercises you can do. This exercise mimics the action of picking up something heavy off the floor, such as children, groceries, bags or all of the above. 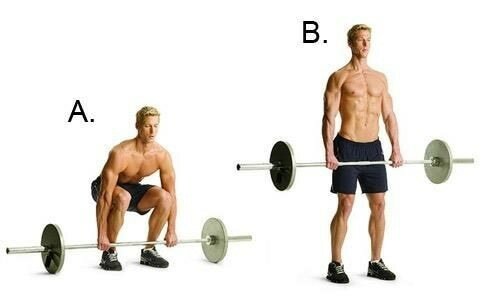 You can use a barbell or dumbbells. The deadlift works your hips, glutes, thighs, back, shoulders and core muscles. 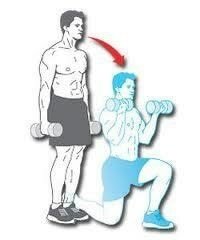 Stand with your feet hip-width apart and place a challenging size dumbbell on the outside of either foot. Bend your hips and knees to lower into a squat and grasp the weights with an overhand grip. Stabilize your abdomen, straighten your back and look straight ahead. Maintain this position as you exhale and press through your heels to lift the weights and reach a standing position. As you near the top of the movement, push your hips forward and pull your shoulders back. Pause and then carefully return the weights to the ground. This full-body compound exercise offers an effective way to work your hamstrings, glutes, back, core and arms in one fluid motion. Hold a dumbbell in each hand with your arms extended at your sides. Adjust your feet to hip-width. Engage your stomach muscles and, keeping your back and legs straight, and bend forward at the waist allowing your arms to hang toward the floor. From here, pull the weights toward your chest by bending your elbows and lifting them close to your body as high as you can. Lower the weights back down and push your hips forward to return to the upright position. Keep your back straight throughout this exercise to avoid injury. Combining a lunge with a biceps curl allows you to work nearly every muscle in your lower body as well as your back, core and, of course, your biceps. Stand holding a dumbbell in each hand. Stabilize your abdomen, straighten your torso and take a large step forward with your right leg. Lunge into your right leg by bending your hips and right knee until your thigh reaches horizontal and your knee is bent to 90 degrees. As you lower into the lunge, bend your elbows to bring the weights toward your chest. Lower the weights then press through your right heel to return to the upright position. Repeat the exercise with your left leg. If there were ever an all-in-one total body exercise, burpees would rank amongst the best. Burpees are a great way to strengthen and condition your entire body with nothing more than your own bodyweight. If you’re looking to change up your workouts or kick it up a notch in the gym, then burpees are just the thing for you. Jump your feet back behind you as you lower your torso to the ground as if in the bottom phase of a push-up. Perform this exercise as fast as possible without rest in between sets. Jump as high as you can each time to keep the intensity high. Try doing as many burpees as you can in 30 seconds. If the intensity is too high try one of the modified versions below or slow your pace. Over time work up to traditional burpees or one of the harder variations listed below, as fast as you can for 30 seconds. Perform this exercise 3-6 times with minimal rest between sets or add it into your current cardio routine. Modified versionThere are a couple ways you can modify burpees to make them easier if you find the initial difficult too challenging. One way is by not lowering the torso to the ground, as mentioned in step two. Instead just jump your feet back while keeping your arms extended as if in a traditional push-up position. Another way to make it even easier is by simply doing Squat Thrusts. This exercise is identical to burpees in every way except it excludes the jump at the end. Instead of the jump you merely stand upright at the end of the movement before repeating. Burpees with a push-upIf you’ve mastered the traditional burpee or if it just isn’t challenging enough, then add a push-up to the mix. After you have completed step 2 and you are in the bottom phase of a push-up, then perform an actual push-up and continue with the rest of the burpee exercise. Ok now, you tough guy or gal, this one’s for you! If you blast through burpees and burpees with a push-up without even breaking a sweat, then here’s your next challenge–add a weighted vest. The more you weigh the more you’ll burn and the tougher this challenge will be. Don’t overdo it too much when starting out though, because it doesn’t take that much to feel the effects of this workout. Whether you are just getting back into exercise or an avid exercise go-er, this one is sure to shape you up. Not only does this exercise challenge your endurance and strength, but it also helps the pounds drop off. Add burpees in at least a few days a week and reap the rewards! Here are details about how to do the Plank. The plank is a balance and core conditioning exercise. In yoga, the plank is often done as part of the sun salutation sequence, or as part of a vinyasa in a yoga flow sequence. You can also perform the plank as a stand-alone exercise. There are two major types of planks, the full plank, where you balance on both arms, and the side plank, where you balance on one arm.